Author of "Healing a Desperate Heart"
“Just then my father broke the silence as we ate by expressing his opinion about something. What was odd, however, was that no one said anything out loud, but I knew what their thoughts were in reaction to what my father had said. As I focused my attention on each person, I “heard” their thoughts in my head. First Carl, then Bill, then Laura, and then Mom. The baby gave me a blank – no thoughts at all. I remember saying to all of them that I had heard what everyone had just been thinking in reaction to Dad’s statement. They just looked at me, no comment was made, and dinner continued. I knew they couldn’t fathom what I said I did, and neither could I make sense of it. – Excerpts from “Healing a Desperate Heart”, Copyright 2016 Susan Bischak. All rights reserved. Used by permission. 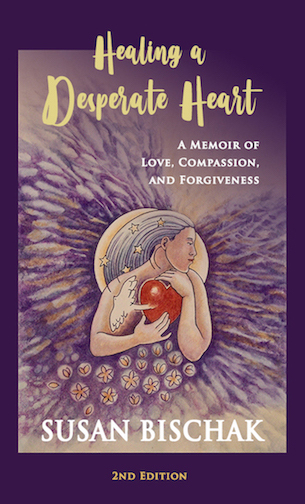 To order the original paperback of Healing a Desperate Heart, click the Buy Now button in the right hand column of this page. Copyright 2017 Natural Harmony LLC. All rights reserved. This entry was posted in Uncategorized and tagged bischak, book, desperate, excerpt, excerpts, healing, heart, medium, susan, telepathic. Bookmark the permalink.